The STC is a community-based coalition advocating sustainable transport in Western Australia. We seek more sustainable and liveable communities where people are less dependent upon the car and have access to alternatives. We seek a transport system and land use pattern that facilitates access, protects the environment and promotes community. This blog is a way of our responding to issues of the day. We welcome your comments on any items, but please make them constructive and useful to others. To add a comment to any post on this blog, select the post by clicking on the title either in the post itself or in the list of posts on the left of the page. Then scroll down to the foot of the post and type your comment in the box. Last Wednesday, 17th February, I spoke as an invited speaker on behalf of the STCWA at a public meeting organised by the Hilton Action Community to discuss issues with the Perth Freight Link. Whilst this meeting was most directly prompted by Transport Minister, Dean Nalder's promoting a tunnel option for a large part of the PFL, it was concerned about all elements - from roe 8, with its major environmental issues, to the lack of connection to the Port itself. My speaking notes follow, below. Reservations for major roads in Perth are defined in the Metropolitan Region Scheme (MRS), usually for many years, prior to the road being built. While some parts of the current PFL are shown in the MRS, others are not. To get them into the MRS requires a statutory process by the WA Planning Commission, including public submissions, and formal adoption. It may not be legal to build those parts of the PFL that are outside an MRS highway reservation. This would appear to include parts of High St, and land for new grade separations at Stock/Leach, Carrington/Leach, High/Stirling and Stirling/Marmion and large parts of any tunnel option. We should be looking very closely at the Main Roads Amendment Bill currently before Parliament. This grants powers to the Commissioner of Main Roads to undertake works outside road reservations, including clearing vegetation without the need to comply with the Environmental Protection Act. "The Business Case outlines strong links between the Perth Freight Link Project and State priorities, policies and initiatives … but the Perth Freight Link project is not directly mentioned in any of the State plans and policies it mentions. This appears to be yet another reason why the 'Moving People' and 'Moving Freight' strategies are being rewritten - to comply with the Government’s political narrative. The current PFL proposal appears to be to call tenders for its construction soon: before details have been decided and before the statutory planning process has been completed. This will create significant risk and uncertainty for potential tenderers to build the PFL, especially when combined with uncertainty about with the proposed sale of the Fremantle Port and the possibility of a change of government. Letting a contract for the PFL under these circumstances will mean it will cost tax-payers more than if the details have been decided through proper process. Tenderers will either load their prices up-front to allow for the uncertainties or prepare their tenders in such a way as to maximise extra payments during the course of the contract. Either way it is certain to be expensive. It also increases the probability of litigation between the State and the successful tenderer if the uncertainties continue to grow. This will tend to result in delays and further costs that will only be productive to the legal profession. Exactly the same applies to the sale or leasing of Fremantle Port, which the Minister for Transport has said he wants to have signed off by July/August. Tenderers will reduce the price they are willing to offer if PFL is uncertain. If the Port is sold with an expectation about the PFL that is not finally met, the State will be exposed to litigation. It would save significant taxpayers money and possible litigation to first finalise planning for port development and freight access and then, if you must, offer the Port for sale. b) the amount by which they do so is greater than for any alternative way of addressing the problem. The second, in particular, has not been demonstrated for the Perth Freight Link. Infrastructure Australia itself has not been able to get sufficient information to satisfy itself that the PFL is the best option for dealing with the land transport needs of WA's international container trade. Indeed, IA 'damns with faint praise' when it concludes: "After accounting for these [risk and uncertainty] factors, Infrastructure Australia still has a high degree of confidence that the BCR is greater than 1.0:1 for the project". According to IA, "Major risks for the project include costs, environmental approvals and community support", which doesn't leave much in the way of certainty, especially as the final link to the port has not yet been defined or costed. IA could not state that the project is warranted because it didn’t have comparable information on alternatives and therefore could not assess whether other options would provide better value to the WA community. The evaluated PFL project was selected from 12 possible ones on the basis of subjective criteria, with only the 'preferred' project being subject to full benefit-cost analysis. None of the 12 options included adequate consideration of the Outer Harbour. - promoting the involvement of all stakeholders and the community in decisions and processes that may impact upon them and the environment. It is clear that the present PFL process is not promoting the involvement of all stakeholders and the community in decisions and processes that may impact upon them and the environment. It is clear that not all options have been considered in terms of their economic, environmental and social consequences; especially the development and use of the outer harbour and the option of moving freight at night. It is unfair of the Government to put professional engineers involved in the PFL in a position where they are being asked to act unethically. Is Dean Nalder A Mole? Is Dean Nalder a mole in the WA Government? He is obsessed with burrowing underground and, in the process, undermines his own government, as a spy might do, by floating whacky ideas. It is true that destroying existing urban development to widen roads like Stirling Highway is of questionable value, but transport professionals know that building more roads, however you do it, is no solution to congestion - quite the opposite, as more roads simply generate more traffic. 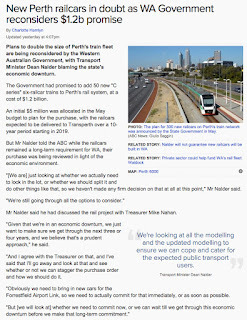 And if you did build, say, another Stirling Highway under the existing one, where and how would drivers get on and off - or must they all go all the way from Perth to Fremantle? Access/egress points would take large amounts of land - most likely at places where land is at a premium, because those are the places people want to get to. Cheap though tunnelling might be in Perth sand, the cost would still be substantial. It is disingenuous of the Minister to claim that it would not be at the expense of public transport and cycling - unless he has somehow found the money tree that Premier Colin Barnett appears to believe exists somewhere, if only he could find it. It's time, Minister, to commit to cost-effective strategies for walking, cycling and public transport to provide real options for the people of Perth, which would also improve road traffic conditions for those who still have to use cars, commercial and freight vehicles. We note with alarm the themes documented in the business columns of last Saturday's West Australian ("Collateral Damage Takes Toll" by Ambrose Evans-Pritchard). In light of the risks to global oil security and the near certainty of renewed oil price inflation in the near future we cannot understand the absence of strategic risk management and appropriate infrastructure investment in Australia. Australia fails to abide by the oil storage commitments required by the International Energy Agency. Adding insult to injury, oil refineries in the nation are being closed down as though they are fast going out of fashion, such that 90% of our refined fuels are being imported!! Meanwhile our State Government has only managed to extend our rail network by a few kilometres since coming into power (the extension of the Butler line in 2014). It has "postponed" MAX light rail and purchase of new rail cars, and is closing freight rail lines in the Wheatbelt, our very own Bread Basket. Other state capitals are busily constructing new passenger rail lines and 21st Century light rail systems. Overseas countries are also 'doubling down' on public transport investment, while some countries such as Norway are also promoting the use of electric vehicles by their population. We hope the time is not too distant when our governments undertake proper risk management and re-evaluate their infrastructure investment and energy security priorities. This will help protect our country and our State from future energy supply shocks and the disastrous impacts of runaway oil price inflation. The same day, the ABC reported Senator Bill Heffernan's expressing similar concerns on fuel security - not only in its own right but also for its potential effect on national security as a whole. As we noted in our letter, it's time to undertake proper risk management and re-evaluate infrastructure investment and energy security priorities. 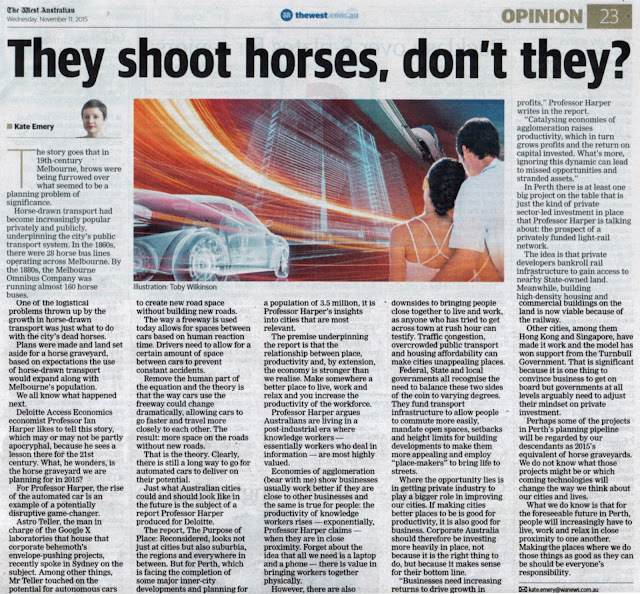 Good piece in today's West Australian by Kate Emery, who does us all a great service by drawing attention to the myopia of planning ('They shoot horses, don't they', West Australian, 11th November 2015), using the example of the 'horse graveyards' planned as an 'inevitable' result of dependence on horse-drawn transport in the 19th century. Our horse graveyards are already with us, in the form of multi-storey car parks. These single-purpose mausoleums are home to inanimate car bodies for most of the day and empty by night. "Perth will be a place of vitality and well-being. There will be a sharing of spaces for living, work and leisure activities, which can be reached easily and safely by all members of the community". If we were actually to achieve this, many of these car mausoleums would be redundant. Indeed, we can already see the beginnings of this in reduced charges (because of lower demand) for car parking in the central city. Now we need to take the next step and start to reduce the amount of car parking, including requirements in local government town planning schemes - which also increases the density and activity we can get in an area. To do so requires governments to get serious about creating more accessible places, not simply set arbitrary infill development targets, and to make alternatives to the car (public transport, walking and cycling) feasible options for as many of us, in as many places and for as much of the day as possible. Premier Colin Barnett has a habit of white-anting his Ministers and hanging them out to dry (apologies for the mixed metaphors). Witness the appalling treatment of Local Government Minister, Tony Simpson, during the local government so-called reform process of 2014-15, when Simpson was still talking it up while the Premier was ready to run up the white flag. In the case of the Perth Freight Link, this is far from the first time that he has left Transport Minister, Dean Nalder, red-faced and defending the indefensible. It raises the question, though, of how someone as closely-identified with the project as the Premier can say, now, that the PFL is "incredibly complicated, incredibly expensive for what it does" - when it was obvious to so many right from the start that this was so. Add to that, the very real concern that "what it does" is not what is in the best interests of Western Australia - as evidenced by decades of bipartisan freight and port planning for Perth predicated on the development of an outer harbour container terminal. Good to see, though, his finally acknowledging the need for the outer harbour container terminal and its relevance for the proposed PFL. But Roe 8 is still a problem - and not only because of the destruction of valuable and irreplaceable wetlands. Roe 8 is a problem because, like the PFL itself it is a road to nowhere. In the absence of either PFL Stage 2 or a commitment to the Outer Harbour, Roe 8 will simply funnel more trucks onto roads that are already struggling to cope and still does nothing to create better (from everyone's perspective, not just the freight industry) access across the Swan River and into the port itself. So what are we likely to see in 12 months, which will be only 4 months or so from the next election. It isn't likely that Barnett will resurrect PFL Stage 2 in an election campaign - except possibly to promise he won't build it and then, if he wins, turning round and doing just that (precisely what he did with forced local government amalgamations, so it wouldn't be the first time). Even Roe 8 looks dicey for the 2017 election. Unless it is built really quickly (unlikely given that extensive stabilisation works will be needed across a wetland), the scar that is Roe 8 under construction will be a very visible running sore. Still, if Roe 8 does get built, it will get used and will funnel more trucks to the Inner Harbour - and he could then argue that Stage 2 is needed because of the number of trucks accessing the Inner Harbour. In effect, we created a problem and now we need to build more to ameliorate some of this problem and create a bigger problem close to the port itself. Stranger things have happened. What we need is for the federal government to withdraw funding from the PFL - it has the basis for doing so in that it is no longer the project it originally agreed to fund - and reallocate the money to other, more beneficial, transport projects in WA. Does Perth Public Transport Have A Future? Reports indicate that the WA Government is seriously considering abandoning its commitment to a long-term program of much-need additional railcars. 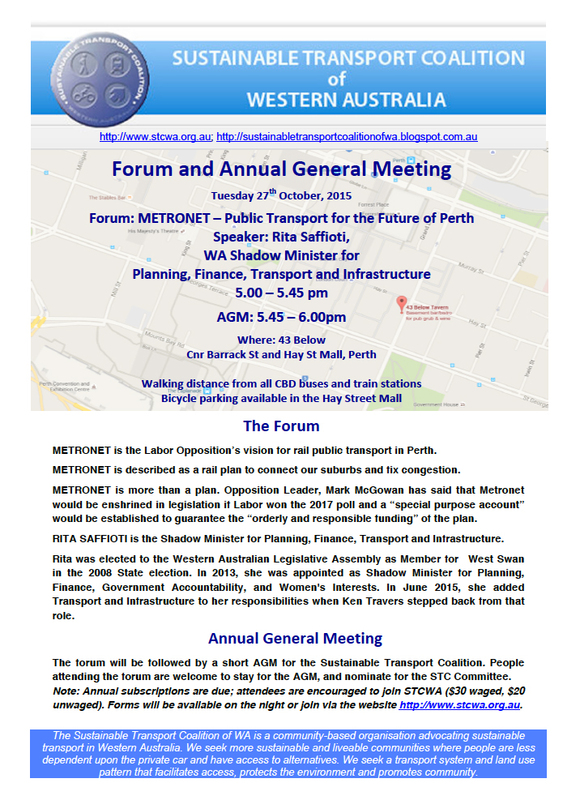 For an alternative vision of the future of Perth public transport, come along to 43 Below (Cnr Hay Street Mall and Barrack Street) at 5pm on Tuesday 27th October to hear Rita Saffioti, ALP spokesperson on Transport, talk about METRONET. And stay (if you want) for a brief Annual General Meeting of the Sustainable Transport Coalition at 5.45pm. We'll report on the year just gone - and we'll be looking for people to join our committee and be part of the year to come. PS The committee meets monthly after work in a city coffee shop, so you get to enjoy a caffeine hit at the same time as helping the cause of sustainable transport. PPS Please pass this invitation on to others who might be interested. Each year, the STCWA holds a forum in conjunction with its Annual General Meeting. 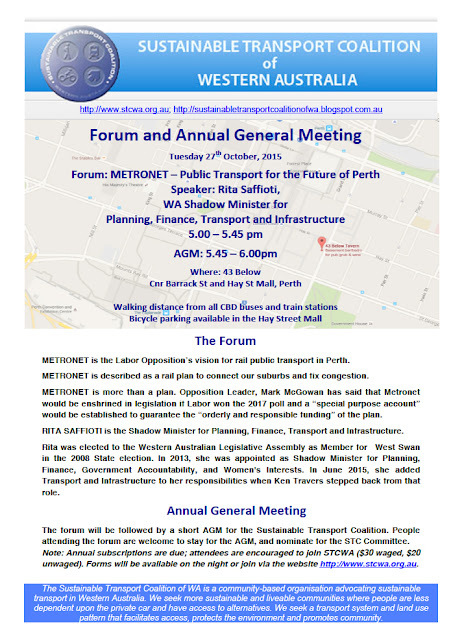 This year, the forum will include a presentation on METRONET from the Labor spokesperson on Planning, Finance, Transport and Infrastructure, Rita Saffioti, MLA. The 43 Below Tavern makes the meeting room available free of charge to STC, so we encourage you to patronise them for a drink or a meal before or after the meeting. The Prime Minister, Malcolm Turnbull, has announced his new Ministerial team, which includes a Minister for Cities and the Built Environment. The PM has also stated that the Government would no longer prioritise roads over public transport. These are hopeful signs that indicate a change to a more balanced way of looking at national transport requirements. The STC has sent an email to Malcolm Turnbull encouraging him to adopt this 'new way' and asking that he revisit federal funding in relation to MAX Light rail and the Perth Freight Link, in the Perth Metropolitan Area, and the issue of Tier 3 Grain Rail lines in regional WA. On behalf of the Sustainable Transport Coalition of Western Australia, I congratulate you on becoming the 29th Prime Minister of Australia and wish you well. The STC has been very concerned at the lack of effective involvement of the federal government over the past two years in matters of urban transport and, in particular, the government's 'sticking to its knitting', which meant funding roads and not public transport. In this respect, we note with approval your appointment of the Hon Jamie Briggs MP as Minister for Cities and the Built Environment and your reported statement that the Government would no longer prioritise roads over public transport (http://www.abc.net.au/news/2015-09-22/light-rail-back-on-agenda-with-turnbull-expert-hopes/6793438). The STC has long promoted transparency and a level playing field for transport funding and investment (http://sustainabletransportcoalitionofwa.blogspot.com.au/2014/10/transparency-and-objectivity-needed-in.html) as has the Federal Government's own Bureau of Infrastructure, Transport and Regional Economics (http://bitre.gov.au/publications/2014/overview-project-appraisal.aspx) and by Infrastructure Australia (http://infrastructureaustralia.gov.au/policy-publications/publications/files/Australian-Infrastructure-Audit-Key-Findings.pdf). We hope that your appointment of a Minister for Cities and the Built Environment heralds a new era in the way business is carried out. In Western Australia, your predecessor's refusal to fund public transport resulted in the withdrawal of federal funding from an important light rail project (MAX Light Rail) and its reallocation to a highly contentious road project (Perth Freight Link - see http://www.rethinkthelink.com.au to see how contentious it is) that had not previously even been on the transport agenda and runs counter to decades of port and related transport planning that had bipartisan political support. Infrastructure Australia has noted that "the Perth Freight Link project is not directly mentioned in any of [the relevant] State plans and policies" (http://infrastructureaustralia.gov.au/projects/files/WA-Perth-Freight-Link.pdf). Neither the abandonment of MAX Light Rail nor the planning for the Perth Freight Link has yet reached the point of no return and we respectfully request that your Government reassess its funding priorities using objective analysis as part of an inclusive and transparent process. Outside the Perth Metropolitan Area, there is a key issue of the closure of what are known as Tier 3 rail lines, which are primarily seasonal rail lines serving the multi-million tonne annual grain harvest of Western Australia. Lack of funding to maintain these lines is resulting in their closure and a massive increase in heavy trucks on country roads (largely local government roads) not designed for this level of loading. The STC would be very happy to discuss these important issues with appropriate members of your Government by email (catalystian@netscape.net), phone (08 9328 8978 or mobile 0435 305 662) or, should the opportunity arise, in person. Yesterday, we posted a piece an item about the Infrastructure Australia Summary report on the Perth Freight Link (http://sustainabletransportcoalitionofwa.blogspot.com.au/2015/08/transparency-and-perth-freight-link.html). "The Infrastructure Australia assessment gives him [Transport Minister Dean Nalder] cover [on his claims that PFL is a 'fantastic project']. But what he cannot claim is that the PFL is the best solution. That's what taxpayers are entitled to demand"
We have previously commented on this blog about the need for greater transparency and objectivity in government decision-making. The recently (and reluctantly) released Infrastructure Australia report on the Perth Freight Link is a case in point. This report does provide some greater clarity, but Infrastructure Australia itself has not been able to get sufficient information to satisfy itself that the PFL is the best option for dealing with the land transport needs of WA's international container trade. According to IA, "Major risks for the project include costs, environmental approvals and community support", which doesn't leave much in the way of certainty. IA does not state that the project is warranted because it did not have comparable information on alternatives and therefore could not assess whether other options would provide better value to the WA community. "A rapid BCR was completed for the preferred option only, assessed against the Base Case. A rapid BCR was not completed for additional options to determine if the preferred option provided the greatest net benefits." • Fremantle Port Inner Harbour Port Development Plan." This appears to be yet another reason why 'Moving People' and 'Moving Freight' have abandoned by the Government and are now being rewritten to comply with the political narrative (http://sustainabletransportcoalitionofwa.blogspot.com.au/2015/06/wonderfully-horrifying-and-depressing.html). IA also states that proposed project was selected from 12 possible ones on the basis of subjective criteria, with only the 'preferred' project being subject to full benefit-cost analysis. None of the 12 options included consideration of the Outer Harbour. "The preferred option was selected from 12 shortlisted options. All 12 shortlisted options were assessed against selection criteria and assigned an achievability rating. Based on this qualitative assessment, the preferred option was selected from a list of 4 high rated options." The options considered included pricing and efficiency using existing road infrastructure, investment or subsidisation of rail and a number of road investment options. The options did not include consideration of the Outer Harbour at Cockburn Sound South of Perth." Transport Minister, Dean Nalder, says that Roe 8 is required even for Outer Harbour (see ABC report, below), but this does not consider other alternatives, including properly configured rail and peripheral road infrastructure. The Infrastructure Australia Assessment Summary can be found at http://infrastructureaustralia.gov.au/projects/files/WA-Perth-Freight-Link.pdf.